Why the 2012 GMC Terrain? When replacing my 2003 Ford Explorer Sport, I was immediately drawn to the Terrain for its looks- as I didn't like what Ford had done to the Escape with all of it's roundness. Being the first time I had looked at GM for myself, I liked the chunky style of this truck from day 1 with its bold front end and mean looking grille. Upon test driving this truck and seeing all the great features that come standard, it was an instant love affair! I spend a lot of time on the road for a living, and this truck is extremely comfortable on long trips, offers ample cargo space when travelling, and for the odd occasion I may have to take passengers/clients along with me, the back seat offers superb legroom in which everyone who as ever sat in the back always comments on how roomy and comfortable it is. Although I have never seen this truck get the estimated fuel economy it boasts about in advertising, considering the shear mass of it and it's breadbox front end, with the I4 the fuel economy is very good considering it is a heavy little beast with AWD. I can average 700 kms. out of a tank of fuel no problem and on longer jaunts have seen it break 800 kms. If you are one of those people who complain about fuel consumption in this truck- you should have bought a Prius... because for what it is, it is exceptional on fuel. Try a different brand of fuel for a while, some brands have more additives and burn quicker. 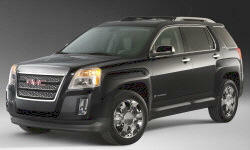 Why Not the 2012 GMC Terrain? Although the I4 is quite peppy considering the mass of this truck, the transmission can be very quirky, with odd shifting and the odd bucking on occasion (when in heavy traffic it will kick so hard you almost think somebody hit you from the rear). Sometimes when you go a little hard on it to pull out into a lane it will hesitate and go dead for a couple of seconds, with the electronic shifting it almost seems like it's thinking too much. The other dislike I have is that there is no transmission dipstick- it is a sealed unit so there is no easy way to actually check and monitor transmission fluid. If you aren't the type who can trust using your mirrors when you drive, this is not the vehicle for you. With the integrated convex blindspot mirrors, lane changes are made easy, but if you are the type that has to look over your shoulder all the time, forget it. I'm 6 feet tall, so I am away from the steering wheel- in which the A pillars also cause huge blindspots, especially when sitting at corners to make right hand turns- often you have to triple check before proceeding or relying on your passenger to tell you if your going to run over a pedestrian crossing the street. The rear camera is pretty much a necessity in this truck as well, although it would have been 100% more helpful had they privided guidelines to aid you in keeping the vehicle straight when backing up- the fisheye lens usually makes you go a little crooked. The standard audio system, moreso noticeable when using satelitte radio leaves more to be desired. It just isn't loud enough. I did replace all speakers with ahigher end brand which greatly improved sound quality, however due to the nature of high compressed files with satelitte radio, I strongly suggest going to the upgraded audio unit offered. All in all, I love this truck. I've put 56,000 kms. on it in the first year, so I have spent a great amount of time in it. It is wonderful on the highway, absolutely exceptional in bad weather conditions (SNOW!) and is fun to drive. With a few little appearance modifications (tinted windows and taillights, ventvisor window shades and GM offered splash guards) this truck turns heads quite frequently- it is a great looking vehicle that offers a lot of advantages- good fuel economy, plenty of legroom for passengers and ample cargo capacity for the average individual. I'm an on the road salesman carrying samples and displays around all the time- this truck totally fills my needs. Would I buy another- absolutely, but with a V6 next time. All in all, this is a great vehicle- the exterior esthetics are very rugged yet refined, overall handling is great, fun to drive and although it does not get anywhere near the fuel economy boasted in advertising, considering what it is the fuel consumption is exceptional and very tolerable, it isn't a wallet drainer. It is a great looking vehicle that provides great comfort and security.